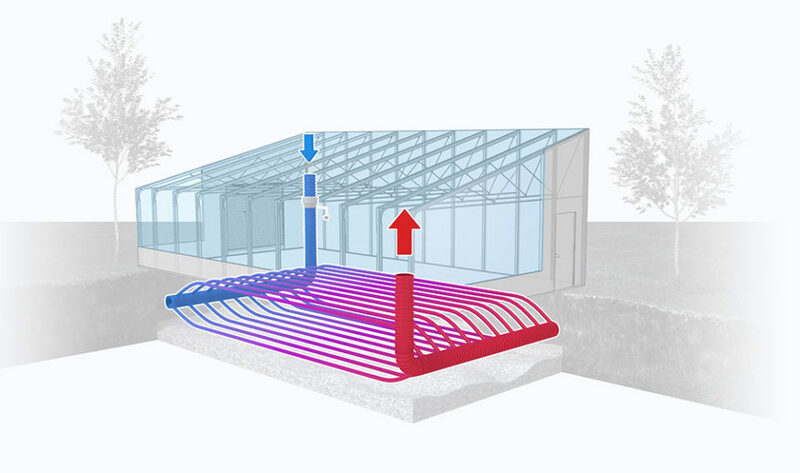 A Ground to Air Heat Transfer system– also called Earth Tubes or a Climate Battery – is a low-cost method for heating and cooling your greenhouse year-round using only the sun and the thermal mass of the soil underground. For more info on how it works, see our GAHT page here. A GAHT system is relatively simple to build and install if you have the right plan in place. Creating the plan and knowing what to do, however, can be more tricky. In many cases, small mistakes in the design or install can render the system ineffective, causing the time and energy you put into the project to be wasted. Moreover, a poorly designed system will prevent your greenhouse from operating energy-efficiently and growing to it’s full potential. 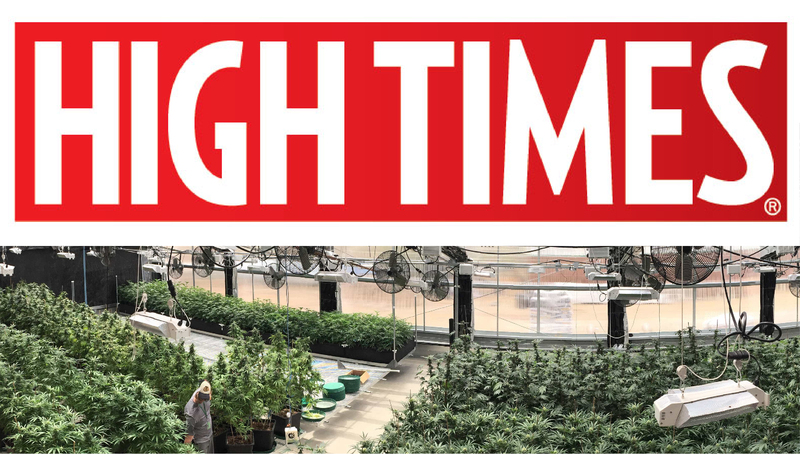 For this reason, at Ceres we offer designs, materials lists, and installation instructions for our GAHT systems to help people avoid common pitfalls and create the most energy-efficient, cost-effective greenhouse possible. We also customize our GAHT plans for your greenhouse, ensuring that the system is sized and designed properly. Once you know what to do, the purchasing and installation of the components is straighforward. Please see our DIY plans page for more info on our GAHT design packages. How much energy you can store underground all depends on how much air is moving through the soil. In most cases, the heating and cooling capacity is directly proportional with the amount of air movement. Thus, it’s important to use fans that are powerful enough for your greenhouse. However, you don’t want to go too large: At some point, additional airflow will not yield additional heat transfer and the fan power is wasted. In other words, there is diminishing returns when you increase the fan size above a certain threshold. Fan sizes and sourcing information is included in our GAHT design package. The diameter of the underground pipes should be correlated with the amount of air moving through them. If air is blowing through a pipe that’s too small it will create resistance, which will greatly reduce air-flow and damage the fan over time. If the pipe is too large, there will be enough air flow but heat transfer will be diminished. This occurs because air movement changes from a turbulent flow pattern to laminar flow. Laminar flow will reduce heat transfer. Knowing the depth the pipes should be buried is also important. At Ceres, we often recommend burying pipes 2′-4′ below grade in order to get the pipes deep enough while still being above the water table. In some cases we have seen of people designing their own systems, they bury the pipes just 1-2′ below ground. This reduces the total mass of soil the GAHT system can use to store heat, and does not reach the stable temperatures of the soil deep underground. There are several different ways to layout the sections of pipe underground, either forming one or two layers, a single connected system, or multiple separate systems. The graphic above displays two layers, each forming it’s own independent system with its own fans that can be operated separately. Here there arises another variable: the length of the pipe, or distance between where the air comes in and where it is exhausted back into the greenhouse. If the underground pipes are too short, there will not be enough time for the air to fully transfer heat to the soil, or for the soil to transfer heat to the air. Heat exchange is greatly reduced. 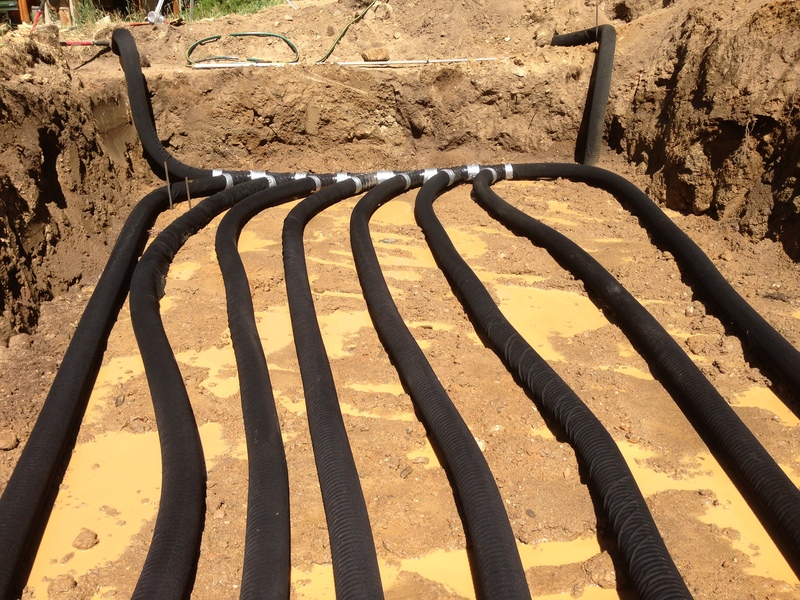 If the pipes are too long, most of the heat exchange will occur over the beginning distance of the pipe system, heating that part of the soil more than the rest. In addition, trying to pump air through too long a pipe will reduce the airflow coming out of the system. Air can leak out between connections in the pipes if they are not properly sealed. This reduces the airflow going through the system; less air will come back into the greenhouse. If pipes underground are not perforated, water vapor will condense in the pipes and cause mold issues. 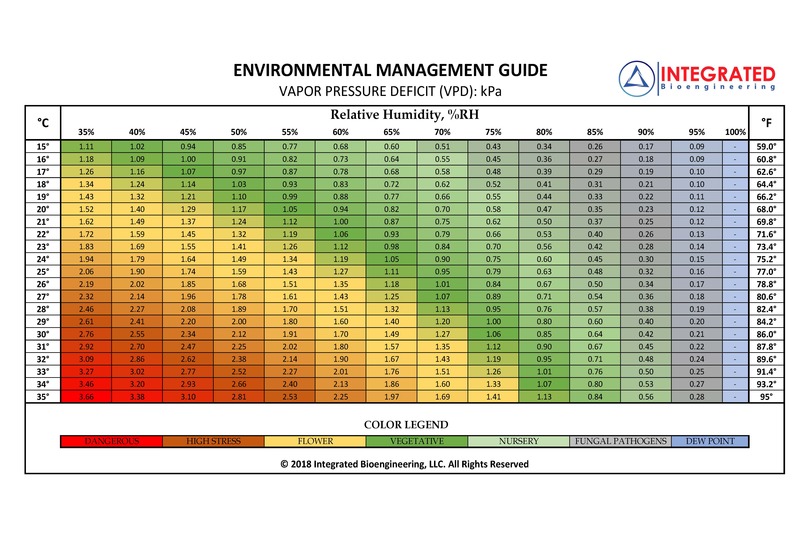 Remember that air entering the system during the day is hot and humid. The temperature of the air drops as it moves underground, forcing the water vapor to condense into water. Stagnant water in the pipes can cause many issues with the system. While you want water to be able to exit the pipe, you also don’t want dirt or bugs getting into the pipes and clogging them. We therefore use drainpipe that is covered with a thin layer of cloth, and cover exhaust pipes with chicken wire if they are close to the soil. Some people use inline fans that run off DC power so the system can be connected to a solar panel. While a nice idea, we’ve found these fans don’t do well in humid environments and fail after only a year or two. A GAHT system should be smartly automated. 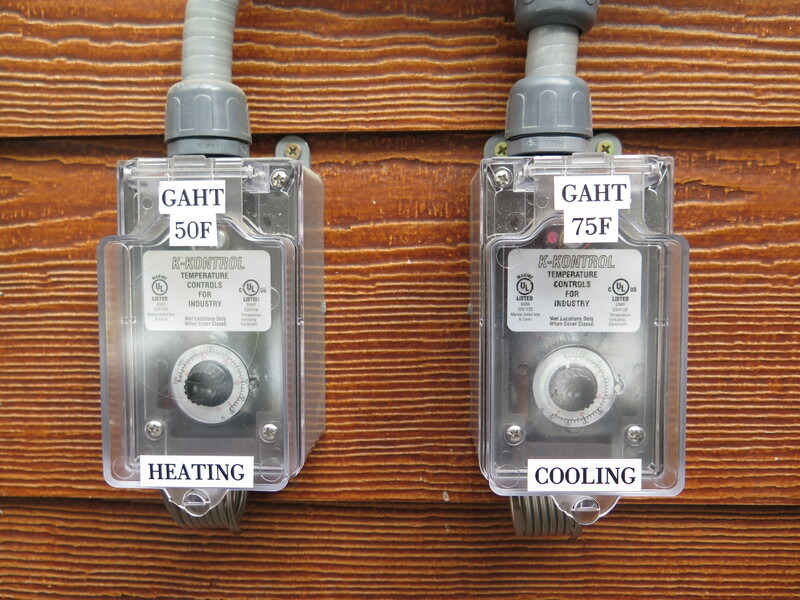 At CERES we use two thermostats to operate the GAHT system : one turns the system on when the greenhouse is too cold; one when the greenhouse is too hot. When the greenhouse is at an ideal temperature in between, the fans are off. Therefore, we say our systems have both a ‘heating mode’ and a ‘cooling mode.’ This allows the fans to only run when climate control is needed, and not waste electricity. If a GAHT system is not controlled by two thermostats, the fans would run continuously, using energy when the system does not need to be running. Thus, to reduce energy costs, the GAHT fans should be wired for both a heating and a cooling mode. Wiring instructions are included in our GAHT design package. At CERES, this is where all of our work designing these super energy-efficient climate systems comes into play. We use a combination of past case studies and energy calculations to design a GAHT system that is tailored for an individual greenhouse. This means the right components are chosen so the system has enough heating / cooling capacity for your climate and greenhouse size. In some cases, a GAHT system needs some back-up heating and cooling, and we plan those in too. All of the materials used in a GAHT system can be purchased online or at a hardware store. Though they are off-the-shelf components, materials should be selected carefully to ensure ease of installation and durability. At Ceres, we’ve curated our materials so that parts can be installed easily, replaced if needed and will last in this application. We use fans intended for high-humidity environments and durable pipe that can be buried underground. This allows the best of both worlds: if a part is damaged, it can be easily replaced, however parts will likely last for decades. We also take care to ensure that parts can be installed quickly and easily by ordering materials in the right sizes. Very few tools are needed for installation. A final consideration is the noise of a GAHT system. Running large fans creates a low hum in the greenhouse that can be annoying if it is close to your home. For this reason, we’ve selected the most quiet fans for the airflow they provide, and offer speed controllers so the fan noise can be manually reduced. If you’re considering a Ground to Air Heat Transfer system, climate battery, or earth tubes to heat and cool your greenhouse year-round, get in touch with us to learn more about how to optimize your system and maximize your investment.